STEM – Science, Technology, Engineering and Math – is all the rage this back to school season. Whether your kids are learning this curriculum in the classroom or not, it’s never been so easy to teach or reinforce this learning at home. Here are the 5 hottest tech tools and apps that are available for less than $8 or free on most tablet devices to make learning accessible, everywhere! Whether your kids spot the drone rolling through the school hallways or after school flying high in the park, it’ll be the most popular activity for kids learning code, in and out of the classroom. Well-behaved coders can purchase a Parrot mini drone ($69) here. Don’t just program robots and drones, learn how to make them with LEGO MINDSTORMS EV3! Young Lego fans will get a chance to play and learn at the same time. LEGO MINDSTORMS EV3 makes building, programming and commanding your own LEGO robots smarter, faster, and more fun than ever. Kids can follow simple steps and before you know it, they’ll be in control of robots that drive, shoot, slither, walk, slam, and spin – to name just a few of the actions that come with this awesome robotics set. Turning your kids into makers has never been so easy! LEGO MINDSTORMS EV3 is available for $34 here and the app is available for free for all tablets. Practice adds up with Splash Math and parents can supplement traditional math lessons with this comprehensive math practice program that adapts to your child’s need and skill. 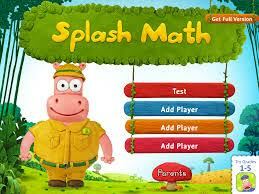 Splash Math has excellent sounds and graphics. Available on desktops, laptops and iPad for free. Science goes intergalactic with Galaxyz! Galxyz is a science education app for tablet computers (or playable online) intended for children in upper elementary school (third grade and up: the ability to read is a requirement for independent play). It’s based on the Next Generation Science Standards, the first interactive learning experience to do so. The app uses a narrative structure in which a young blue-skinned person named Thalo (you can choose a male or female version) walks through an icy landscape and meets a small flying squirrel-like creature. The creature turns out to be Grit, a Chakkaran on a mission to protect the Tome and guard scientific knowledge. Grit guides Thalo through text to explore aspects of science, and, along the way, teaches scientific terminology and concepts. Pricing ranges from ninety-nine cents for a new module and $7.99 for all available modules or a subscription option for all future modules. While students have been using flash cards to memorize facts and vocabulary at least since the Victorian era, it’s no secret that the study tools can be deathly dull. 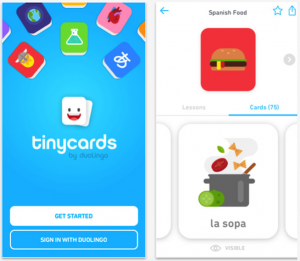 Duolingo, the free language learning app just launched TinyCards, a game-like, modern version of flash cards that automatically tracks what users already have learned and even lets users level up, video game-style, as they progress in their knowledge. TinyCards launched with hundreds of illustrated virtual decks on subjects from languages to science. Users are also able to create and share their own decks on subjects of their choice, from wine pairings to characters from Game of Thrones and Pokémon and available on iOs. Self Disclosure: Info was provided. SoCal City Kids did not review any of the above.